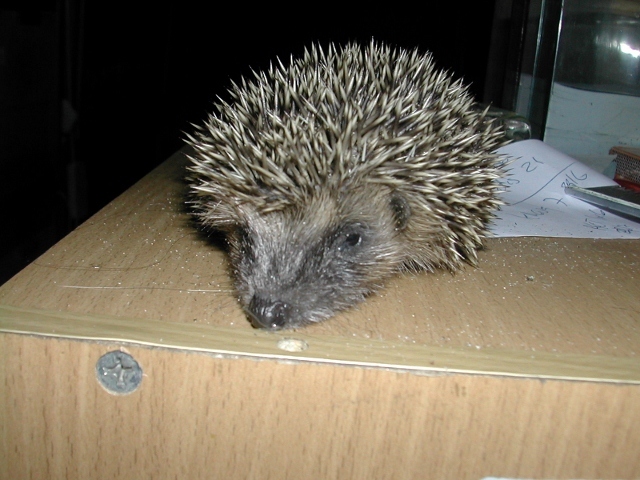 Misguided people sometimes “rescue” a healthy hedgehog in the road at night and put it in their (enclosed) garden to eat slugs and other pests. This is very cruel because hedgehogs wander long distances every night, especially in the breeding season, and they know their own home area very well. So if you find an uninjured hedgehog at night in the road, please move it out of harm’s way nearby, but not more than a few hundred metres from where you found it. 1. Hedgehogs lying out in daylight Hedgehogs are nocturnal, so if they are lying out of their nests during the day, that is a sure sign that something is wrong. A healthy hedgehog does not “sunbathe” on the lawn. Please phone 734340 if you are in Jersey or your local hedgehog hospital in the UK for advice, even if you cannot see an injury. Because they roll up if they are frightened, it is often very difficult to see if they are hurt. If they are injured we take them to the vet to be examined under anaesthetic. Hedgehogs found lying out in daylight even if not hurt will very often be dehydrated. The spines on a dehydrated hedgehog will lie flat against its back and not stand up at all angles as they do on a healthy hog. Abandoned baby hedgehogs may have flies’ eggs or maggots on them (especially in warm weather) which will need to be removed as soon as possible (with tweezers, flea comb or old tooth brush). If you see clusters of tiny off-white coloured grains like small grass seeds on the hedgehog, these are fly eggs and it is a sure sign that it has been without its mother for some time and is in urgent need of help. Please pick it up with gloves or using an old towel and put it in a box, keep it warm, and if it has a pointed face and teeth, it is safe to offer it a small amount of cat or dog food and a dish of water until you can get some help from us on 734340 if you live in Jersey or from your vet or local wildlife hospital if you live in the UK. 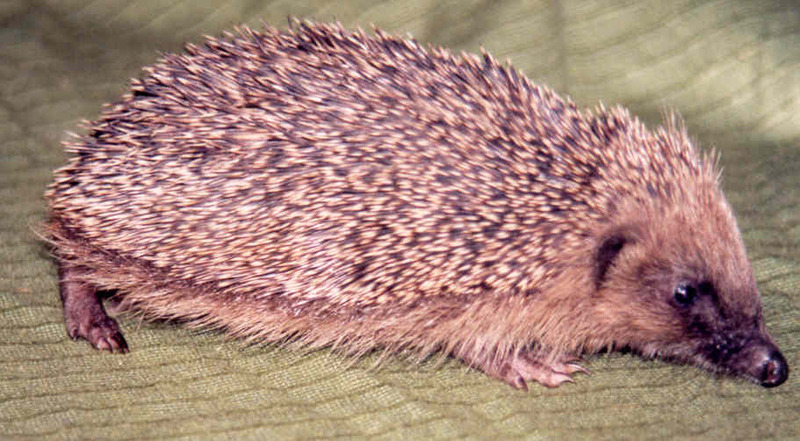 Or by phoning the British Hedgehog Preservation Society on 01584 890801. Only feed it solid food if it looks like a miniature adult hedgehog as in the picture above on the right. If it is younger than this, like the one on the left, please phone for advice immediately on 01534 734340 in Jersey or 01584 890801 in the UK as we have specialist replacement milk. DO NOT attempt to feed it with cow’s milk or other replacement milks for humans or pets. If the hedgehog is very young and has no fur on its tummy, it may need TOILETTING to help it empty its bladder and bowels, if this is not done as it will be unable to do this itself it will die. A sure sign that it is in discomfort will be a high-pitched squeaking noise like a baby bird. This can either mean that it is hungry or needs toiletting (or both!) Toiletting means stimulating the baby to urinate and defecate by gently tickling its genital area with damp or Vaseline covered cotton wool and cleaning and drying it well afterwards. You may like to care for older orphans yourself, please go to CARING FOR ORPHANS, however, nestlings have a better chance of survival if cared for by an experienced rehabilitator, so please phone: 01534 734340 in Jersey or 01584 890801 in the UK. After the end of November any young hedgehog which has not reached a safe weight for hibernation (450-600g) may not survive the winter in the wild. If they are found and brought to us, we care for them until they are big enough when we release them in mild weather or wait until Spring if they decide to hibernate in care. 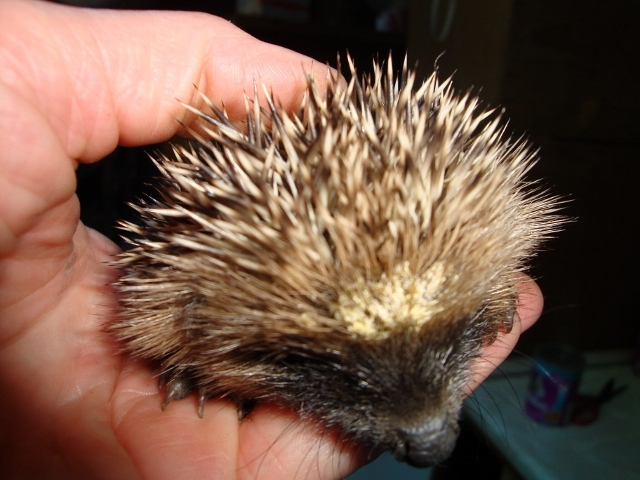 If you find a small hog after dark in winter, please contact us for advice and help as these autumn juveniles often suffer from lots of worms and may not survive without medication and experienced care. Please phone us on 734340 between 8am and 8pm, if it is later than 8pm put the hedgehog in a box with some ripped up newspaper to hide in and some water and dog or cat food, keep him in a warm room and phone us after 8am. If the hedgehog is hurt or needs immediate veterinary attention please phone New Era Veterinary Hospital on 07797 711585 if it is after 8pm and take him to their hospital in Georgetown. If you are unable to take the casualty to the vet, please phone the JSPCA emergency line on 07797 720331 and they will collect the hedgehog from you and take it to the Veterinary Hospital. You will not be charged for the vet's or JSPCA's services. If you do not live in Jersey, please contact your vet or nearest hedgehog carer. The British Hedgehog Preservation Society has a list of UK carers, please phone 01584 890 801, they have a 24 hour answerphone service. If you disturb a nest of very young hoglets, please seek advice as soon as possible, circumstances vary and we do not want to remove babies when the mother is hiding nearby and likely to return to the nest. If the nest site has to be destroyed e.g. when a shed is demolished and the nest was underneath, please do all you can to keep the mother with the babies without touching them with your bare hands. Put a large box, dustbin or bucket over the entire nest and phone for help. If you touch the babies the mother may reject them. However, if you find a solitary hoglet and cannot find the nest to return it to, please do rescue it, keep it warm and phone 01534 734340 (or your local carer or vet if you don't live in Jersey) for help urgently, do not feed it cow’s milk, we have special milk replacer to feed it. 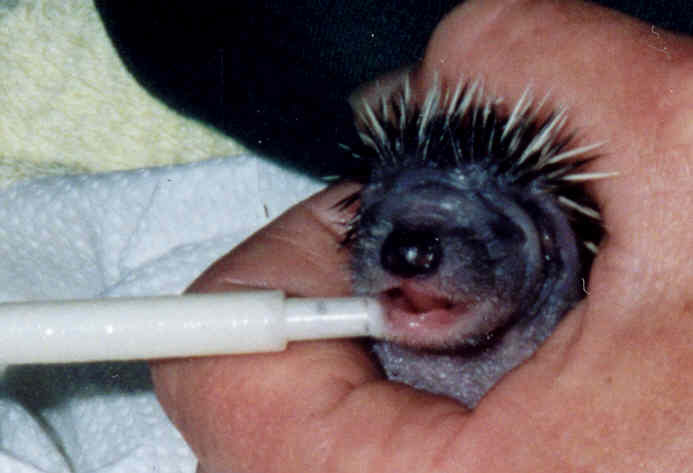 Hedgehogs cannot digest the lactose or milk sugar in cow’s milk and it can kill young hoglets by giving them diarrhoea. Please wear gloves or use an old towel to protect yourself from their spines and any infection or parasites they may have. Pick it up and put it in a deep box with some ripped up newspaper or hay to hide under. Offer it some water to drink and some dog or cat food to eat, do not give it cow’s milk, as they cannot digest the lactose and may get a tummy upset if they drink it. Please cover the box to prevent escape and keep it inside away from flies and if the weather is cold, in a warm room, until help arrives. Phone 01534 734340 for help or advice. If you are able to bring the hedgehog to us, we do appreciate your help, especially when we are busy looking after existing patients, it can take an hour or more to do a return trip, and during this time we could have cared for about 10 hedgehogs which are already here. OUT OF HOURS EMERGENCIES FOR INJURED HEDGEHOGS BETWEEN 8PM AND 8AM: New Era Veterinary Hospital, Georgetown - please phone 07797 711585 and take the hedgehog to the hospital. If you are unable to take the casualty to New Era please phone the JSPCA emergency ambulance line: 07797 720331. You will not be charged for JSPCA or veterinary services. If the hedgehog is unhurt, please put it in a box with some cat/dog food and water and ripped up newspaper to hide in, keep the box in a warm room and phone 734340 after 8am the next morning. If you live in the UK, please phone the British Hedgehog Preservation Society on 01584 890 801, out of office hours they have an answerphone which gives you the phone numbers of carers who will answer your call round the clock and give advice and be able to put you in contact with a hedgehog rehabilitator in your area.